Recently my ace mechanic Bill Arnold mentioned to me that the calipers were dragging. Over the years there have been a few times I’ve noticed that the brakes on my 2002 were inadequate. So, after over 300,000 miles, it was time to do something to my original brake calipers. I started looking at brake options. 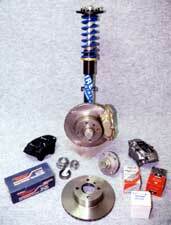 The Big Brake Kit. Photo courtesy of Ireland Engineering. The BBK from Ireland Engineering comes with freshly rebuilt calipers from another type of car – a ’74-79 Volvo 242, based on the brake pad box – with the mounting holes welded shut then redrilled about a 1/2 inch closer to the caliper body. This allows a larger pad contact area, and also permits clearance for many 13″ wheels (but NOT stock steel wheels, according to Jeff Ireland). You need to supply the brake fluid (DOT 4, of course) and wheel bearing grease (I used Redline). 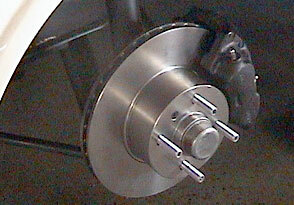 The kit uses vented rotors from an early (1977) 320i and used 320i hubs. 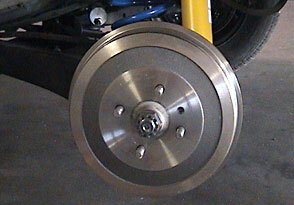 The Volvo calipers fit over the rotors. The kit also includes wheel bearings, wheel studs (or bolts, if you prefer), brake pads, and assorted small stuff like spacer washers to center the calipers over the rotor. Along with this upgrade I suggest installing a new master cylinder and new rear wheel cylinders. I used tii parts. The tii master cylinder has a larger volume, to push more fluid with the same amount of pedal pressure. The 17mm wheel cylinders balance the bigger front rotors better while still ensuring that the fronts lock up first (for safety). Ireland Engineering removed the old bearing races from the used 320i hubs before I took delivery. They have a big vise, punch and hammer which made things easier on me. I installed the wheel bearings into the hubs. I was surprised at the pounding necessary to get the new bearing races into the hubs, and suggest a bearing driver, or at least a supply of proper diameter washers to hammer against. I do not recall the OEM 2002 bearing races needing so much force. Greasing, sealing and mounting are similar to typical 2002. The Redline grease seemed closer to OEM 1973 BMW wheel bearing grease than other types I’ve seen. 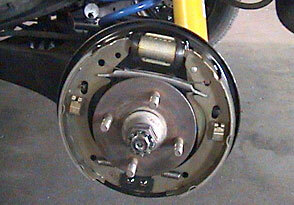 The rear brake drum. Photo courtesy of Ireland Engineering. Next, I installed the new tii master cylinder. Of course, I planned to do it all in a day (or weekend), so I drained the brake fluid and disconnected the reservoir. The new cylinder went in just fine. Bill Arnold’s advice was to forget about using plasti-gauge to determine play in the driving pin for the master cylinder. He says he only checks if it seems bad. Plasti-gauge is a tiny string of malleable plastic that will extrude to a repeatable width when compressed to a certain height. Most often you find it to check bearing clearances when rebuilding engine main bearings, but it will also work to measure other clearances (like 0.004 inches). To use, place a small length of plasti-gauge between the surfaces needing clearance, assemble the parts, then disassemble them and measure the width of the remaining plasti-gauge; that indicates the clearance between the parts. I took this opportunity to replace the tubing from the reservoir to the master cylinder. 5/16 vinyl tubing from the hardware store works fine but is a slightly looser tolerance than OEM BMW tubing. Clamp carefully because the right angle (elbow) connectors that fit into the master cylinder grommets (either standard or tii) are notoriously fragile and not a typical dealer item. A ham-fisted effort will cause grief. I discovered that the new caliper doesn’t fit while installing the new hub and new caliper!! It interfered with my OEM brake backing plates, and doesn’t align with the mounting holes. Photo courtesy of Ireland Engineering. Ireland Engineering were surprised that I still had my backing plates, and confirmed that if I wanted to keep them I would need to cut them away for clearance. I removed about a 1/2 inch from the plates where they came closest to the new calipers. I wanted to keep the backing plates because I still like the shielding they provide for dirt to the inner wheel bearing and for water and mud to the rotors. I think that backing plates serve road cars well. The new rear wheel cylinders; went on with no problems. I bled the system with the aid of my wife, Marti. A quick drive showed the brakes working but just barely. More bleeding and Marti commented that the pedal was hard to push, a good omen. The trial started with a couple of easy stops from slow speeds the brakes felt fine. Then on a deserted road I tried to check the system balance with a stop of about 7 out of 10. At first the brakes were great, then almost instantly the pedal went to the floor! Creeping back home I noticed blue (ATE Super Blue) brake fluid on the right front wheel. After removing the wheel and washing it off, I couldn’t see the problem. But as soon as Marti pressed the pedal, fluid squirted from the top of the caliper. The caliper had a tiny black protrusion at the top, and this was leaking. Before getting high pressure from a spirited stop, it worked fine. Another call to Ireland Engineering, and Jeff was surprised to hear about a problem. He did, however, find another caliper to send overnight. Unfortunately after installing and bleeding the system again, the new caliper was also defective! Two weeks later, after rushing a group of calipers to his rebuilder, Jeff had another right caliper in my hands. It works fine. Rear brake and wheel cylinder. After a couple of hundred miles to seat the pads, I took my car to a deserted parking lot and checked the brake balance, stopping from about 40 miles per hour. The result was straight braking, with the front wheels definitely locking first. Overall I’m happy with this Big Break Kit, and I am confident that I’ll never have brake-fading problems again. But I also learned that not all simple kits are exactly bolt on, and that rebuilt calipers are not so reliable as new. Based on my experience, be flexible in your need to drive your 2002 when you install a BBK, in case you have problem or two.